I am following up my recent Pumpkin Pie Waffle recipe with my Gluten-Free Dairy-Free Apple Cider Pumpkin Pancake Recipe – perfect for those cozy pajama-ridden holiday mornings when you want to whip up something quick. This recipe evolved from my basic gluten-free buttermilk pancakes because I was looking for a fun and healthy way of making them dairy-free as well. Always on a mission to provide you all with a unique and flavorful way to make my recipes allergen-friendly without the compromise of taste, I decided to replace the buttermilk, that I normally use, with a mixture of apple cider and pumpkin puree. The consistency of the cider and pumpkin, when whisked together, lends to the batter the same consistency of a full-fat buttermilk, without having the effect of a full-fat diet buster. The taste of the two, when whisked together, lends to the palate all of those delectable flavors of winter, without slaving for hours to get them. The smell of the two, when whisked together, lends to the senses the heady aromas of holidays, without having to burn those thickly scented candles to get it. I decided to whip these up the other night before my oldest son’s flag football practice. I was on my way out of town early the next morning and wanted to make sure my husband had something hearty to feed the boys for breakfast while I was gone. So while the other moms from our team were feeding their families stew and meatloaf before the chaos practice ensued, I was busy experimenting with cider and pumpkin and plating up “brinner” (breakfast for dinner) for mine. 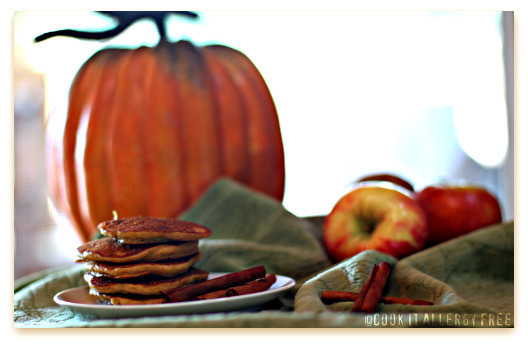 These Apple Cider Pumpkin Pancakes surprised us all. Both of my boys were tickled that dinner before practice was such a treat. Thus, my usual chirping to get them to finish their meal before heading off to practice was silenced by their surprisingly quick inhalation of these. I was thrilled that these were met without resistance, especially knowing that the pumpkin and ground chia seed that are included in these are a nice additional boost to the nutrient value (you can read what Andrew Weil, M.D. says about the benefits of chia here). And the fact that I even managed to get a picture of these and get us out the door to practice on time, allowed me to give myself the “Mom rocks” props that I reserve for those moments when I really manage to impress myself. 1. In large bowl sift together, until well-blended: brown rice flour, almond flour (or additional brown rice flour), arrowroot starch, potato starch, flax meal or ground chia, xanthan (or guar) gum, baking powder, baking soda, and sea salt. 2. In another bowl whisk until well-blended: apple cider and pumpkin puree. 3. Add to apple cider mixture: egg yolks, vanilla, and coconut oil (or melted butter) and whisk until well blended. Set aside and let sit for fifteen minutes. 4. In separate bowl: add egg whites and then using hand mixer, beat whites until soft peaks form. After batter has been sitting, gently fold in whites until just incorporated. 5. Prepare griddle or skillet: Lightly grease and heat to medium high. Pour 2-3 tablespoons of batter per pancake onto griddle (Note: if batter seems too thick to pour, you can gently stir in a little more cider) Pancakes are ready to flip when the edges start to look a little dry and you can see small bubbles forming on the surface. Flip, then cook for 2 minutes more. 6. Serve with warm organic maple syrup and a slight sprinkle of cinnamon. I will be sharing some of my favorite holiday breakfast dishes over the next couple of months since lazy winter mornings are so special to me. Do you have any traditional holiday breakfast recipes that are your favorites? I love to hear what my fellow readers are eating in their jammies…. Wow- sound so yummy and I like the addition of the apple cider. I can’t wait to make these! Hi Andrea! Thanks so much! The apple cider really gives these a nice flavor. Hope you enjoy them too! I love Binner. We had binner last week and everyone was happy! I’d love to try these just to taste them. Thanks for the link to Weil’s article – it was an interesting read. I like to sprinkle chia or flax on the kiddies’ toast. They don’t seem to mind! I love love love checking out your latest pics Kim! Maggie, I am the queen of sprinkling chia or flax meal on and in everything for my kids, too. I put inside their sunflower seed butter sandwiches, in yogurt, on salads, in cereals, on toast. you name it! 😉 LOL. I’m all for cozy, holiday pajama-clad mornings! Hey, today’s even a holiday. If I’d read this before I got my act together and went to work this morning, the outcome would have been much different I’m telling you. 😉 I know I would love the taste and texture of these golden pancakes, Kim. Apple cider and apple cider vinegar can do amazing things in recipes. 🙂 Both photos are so beautiful. They are really getting me in the fall mood! And, um, I think you deserve the “mom rocks” title, not just a temporary label! Had way too much fun with you this weekend.! I can’t believe you have your act together so well that you already have a post up. I’m still trying to catch up on sleep. As well as having a fight with my camera and Picasa. Grrrr. But, I am so happy that you are going to do all of the pumpkin experimenting for me. I love pumpkin flavor, so I can’t wait to see wait other recipes you come up with for me to make. Tia, I would not call it having my act together, LOL! I made these before I left for SF and then wrote up my post on the 2 hour plane ride home. You are ahead of me, considering you have already had time to read other people’s blogs. I am so far behind in that right now. That is going to be my down-time tonight – getting in my jammies and reading yummy recipes!! You are such a blast and I loved hanging (and sleeping) with you! Hi Ricki!! I hope you can return to Apple Cider soon too because these really do turn out really light and fluffy. What a great way to use up my pumpkin and with morning temp in the morning being -2C this will be nice for everyone 🙂 ! Thanks so much for stopping by Tracy! I cannot imagine morning temps at -2 C. That would definitely require WARM cozy pajamas!! Hi Butteredpoweredbike! I will keep you posted when we (or anyone else) tries it without eggs. I will definitely put the substitutions and measurements up once we do!! Thanks for letting me part of Hearth and Soul again! I almost made apple cider pancakes tonight but then ended up going with something else. I have more apple cider in the fridge though. Now I just need to go buy eggs and I can make these! I will have to sneak some cider away from my husband for this. Oh, do you mean ‘hard’ cider or just juice? We are supposed to speak the same language, but sometimes it doesn’t seem it! LOL! Hi Intolerant Chef. I was thinking of regular Apple Cider, but feel free to give it a go with the hard stuff!! Hi girlichef! My pleasure to hook up with the Hearth and Soul hop this week. Thanks for letting me be a part of it! Hey Kim! I bet Jon would love these!! So many pumpkin recipes to try… so little time! Wow, another creative way to use pumpkin! Sounds delicious. I look for any excuse to be in my cozy, flannel jammies and I don’t actually need much of one to do so. Yum! 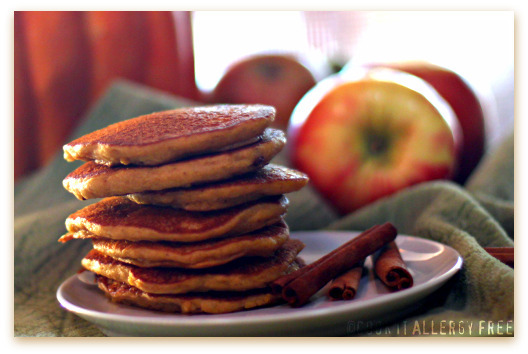 My kids love pumpkin pancakes – adding the apple flavor is such a bonus! Thanks for linking to the Hearth and Soul hop! Hi Christy!! Thanks for letting me a part of the Hearth and Soul hop again! I agree that apples and cinnamon are the perfect pairing for pumpkin! Hi Sue!! Thanks so much! I used to think it was such a treat when my mom let us have breakfast for dinner, so now I will do it for my kids every now and then and they love it!!! Kim, these pancakes look fantastic! I’ll have to try them soon – when I do, expect a blog post about it. 😉 I love the kind of food that just seems to naturally evoke holiday feelings and sentiments – whether that is because they’re so closely associated with the holidays, through tradition or personally, it’s a source of comfort and carries a sense of the familiar. There are so many holiday things (particularly a couple of drinks) I want to make homemade, healthier versions of but haven’t had the time! Hopefully, though, I will find that time soon and share my versions in a timely manner. Thanks so much!! Cannot wait to hear how you like them. Also totally looking forward to seeing what fun holidays drinks that you come up with! Hi Alex! Shockingly, even with the pumpkin, these are really really fluffy pancakes! Whipping the egg whites definitely has something to do with that. Thanks for letting me share them with you this week! Waw!! Your festive & good for you gf pancakes look incredibly tasty! I will make them tomorrow!! MMMMMMMMMMMMMMMMMMMM,..I love whole grains gf flours! Sophie!! Yay! Hope they turn out well for you! With whole grain gluten free flours, they are definitely a good way to start off the day. Do you watch “Scrubs” at all? There is an episode where they talk about brinner..I have to find the clip on Youtube and post it on Facebook for you. HI Hi MRS. Elberson-Lyon! LOL! I have not seen that Scrubs episode, but now I am totally going to have to find it. Congratulations to you, my friend. You looked totally stunning! What a beautiful setting for you guys to tie the knot. I am so so happy for you! We love pumpkin pancakes here! These look and sound delicious! Perfect flavor combination! Yay! Thanks so much, Sarena. I hope you like them. Just found your site and I’m loving it! The pancakes look absolutely DELICIOUS. I’m going to try making them egg-free for me and my boyfriend. 🙂 Thank you so much! Thanks Desi! I hope you enjoy the pancakes! They are a favorite of ours at this time of year. Has anyone tried these without eggs yet? My 3 year old is allergic to wheat, eggs & dairy and unfortunately for him, I’m NOT a wiz in the kitchen and still new to learning how to cook allergy free for him. If anyone has any ideas for how I can go about trying these without eggs, I’d love to make him a Thanksgiving breakfast! Thanks for all of the other recipes! Sites like this have saved this single-mom’s dinner dilemmas more times than I can count! Hi Ami! I am so grateful for your sweet comment. I will be actually making these without eggs this weekend when some of our egg-free friends are over for brunch! Will keep you posted. I plan on using 2 Tbsp of Flax Meal mixed with 6 Tablespoons Hot water (allowed to sit for about 5 min to gel up) as my replacement for the eggs. I will also add 1/2 tsp more baking powder and 1/4 more tsp baking soda to the dry ingredients to help prevent them from being too flat. Let me know if you try them out ! I hope you have a wonderful Thanksgiving!!! Kim, Hi. I just found your website, and have been searching for a good gluten-free, dairy-free (and vegan) pancake and waffle recipe. It’s been a challenge! How did your egg-substitute try go for Thanksgiving? We recently purchased a waffle iron, so I’m dying to try this recipe as a sub for the pancakes. Though my husband is allergic to apples, I’ll have to use a sub for the apple cider, any suggestions? Thanks! I’m completely intolerant of rice *and* almonds. Even trace amounts give me severe stomach pain for 2 days straight. Do you have an alternative flour suggestion? FABULOUS! We just went gluten-dairy-free this week and this was my first venture without flour. OH SO DELICIOUS! Thank you so much for creating this recipe. My children feel loved through pancakes this morning. Thank you so much for reporting back, Meghan!! So so happy to hear that you enjoyed the pancakes! I love getting emails like this! Thanks for letting us know that you enjoyed your first gluten-free and dairy-free adventure! These look fantastic! Do you have any ideas of what I could substitute for the potato starch? My one year old who was just diagnosed with an egg and wheat allergy broke out in hives tonight when I gave him potatoes for the first time. Hi Elreann! Thanks so much! You can just use 1/3 cup + the 3 Tbsp (as listed above it) of Arrowroot Starch instead of the Potato starch. You can usually sub one out for another without a problem and they work pretty interchangeably. And your poor little guy! Hope he doing okay now! I have been making these pancakes for several years now. They are delicious and my whole family loves them. Thank you so much for such a great recipe!